Filled with portraits of beloved female characters, this journal lets readers record favorite books. Filled with watercolor portraits of literature's most beloved female characters, this beautiful journal by artist Samantha Hahn lets readers record what they've read, reflect on their favorite passages, and remember important moments in the story. A satin ribbon bookmark lets you keep your place, while a comprehensive list of prize-winning fiction titles lets you plan your next reading adventure. Made in China. It was amazing to record what we have read and let those thoughts/feelings guide us to our next book. I love all the female character quotes and pictures too! I've often heard my wife state that she's going to write down all of the books she's read, well, the ones she can remember since she first picked up a novel. Not only is this book attractive, clever, and organized well, I know it will generate a bigger book appetite in her life! I believe my wife will read even more books to create yet another review of it/them in this fun book list with great satisfaction. A beautifully designed book, a great place to write your deeper thoughts about a book. Was the perfect gift for the two people I got one for a friend and fellow book club member, the other my niece who loves to read (and think deeply about books). I bought my first one recently for a friend who is in the same book club as me. She also takes my 91 yr old mom grocery shopping each week. So I wanted to add something to her gift that was really personal. She loved it. My niece hopefully received hers last night for her birthday. She is an avid reader. I'm so tired of giving gift cards and Uncommon Goods is the perfect place to find the perfect item. This is a great quality gift... I even got myself one (might end up giving it away, but I really want to keep it)! This is a wonderful gift. Have bought 2 gifts and then one for me also. They are very nicely made, good construction, and provides a great area to write your thoughts. This is the perfect journal! This journal is great!! You can write down the books you loved, plus there are quotes from famous female writers!! Perfect for the Serious Reader! This journal is perfect for the Serious Reader who wants to memoralize their favorite and most thought provoking books. Or really any book that gave them the feels!! A friend is trying to read more and keep better track of what she's read and liked, making this gift perfect for her. In case anyone is wondering (like I was), there are only white women featured in this book. 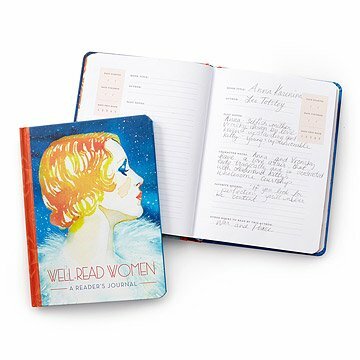 Overall I think this is a great notebook and would buy it for another friend... but it would be nice to see a few non-white women characters painted in the gorgeous watercolors with profound quotes too.